Good enough to visit twice in one day, we had the pleasure of eating all varieties of Rig's waffle sliders for the month of July (before the small but strong menu was updated for this month). And if you've ever been frustrated by trying to locate your favorite mobile food venue, don't fret. This waffle wagon appears to have set up shop permanently in the Blackstone District parking lot in a wonderful symbiotic relationship with Scribtown Brewing and Archetype Coffee. Rig offers 4 total options for sliders. Three what I'll call savory and one sweet. Sliders are $4.50 each, or two for $7.50 (a bit over a 15% discount). I'd recommend getting them all - that's what we did - before we went back later and got more. Interestingly enough, everyone's favorites were different. So Rig has something for everyone. My favorite of this batch was the Ramen, though the Wafelafel came in a close second. 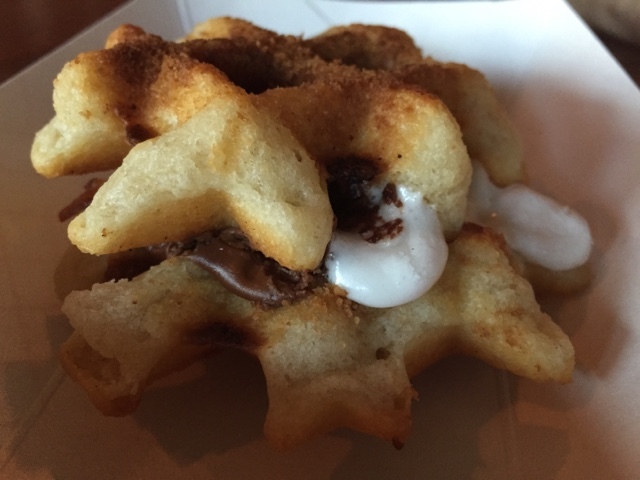 Here's the rundown of the July menu we sampled... the waffles themselves are made of batter specifically crafted to compliment the other ingredients. These are truly gourmet creations - not just toppings slapped haphazard on top of a generic griddled batter. Cobb Smoked BBQ Ham: ham-slider w. peach BBQ sauce & pickled okra. This one was surprisingly my least favorite... but only because the others were so darn great. 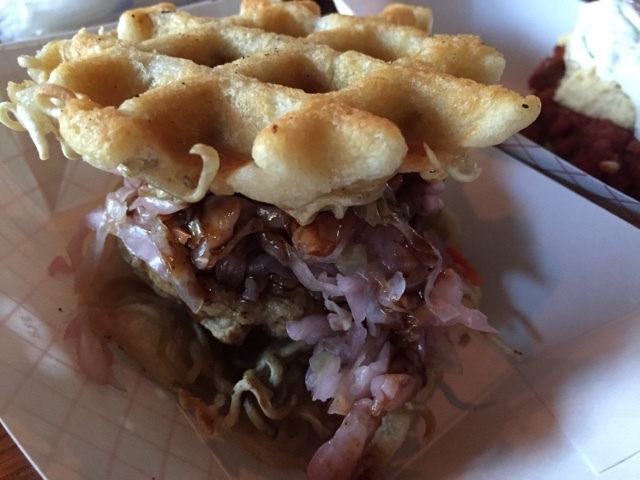 Rig Ramen: slider made of ramen noodles, vinegar slaw, asian-style beef patty & spicy hoisen sauce. I ate two of these. 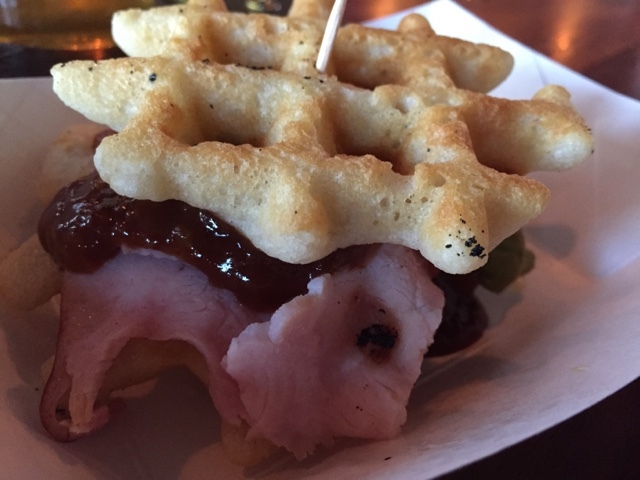 There's ramen in the waffle, for heaven's sake! 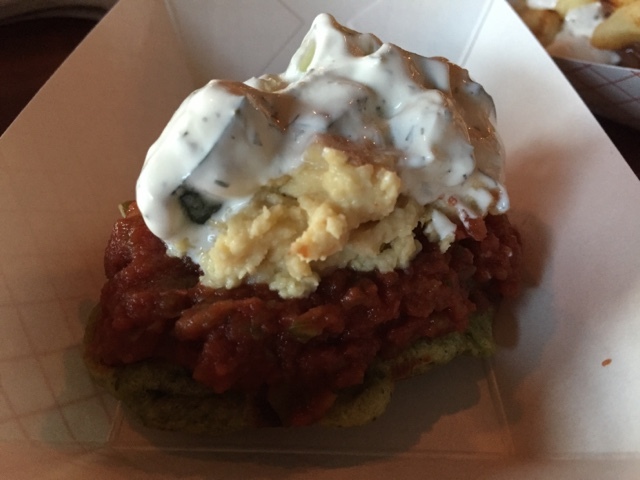 Wafelafel: open faced slider made of house falafel – topped w. hummus, red pepper, compote and dill cucumber sauce. This was a VERY close runner-up favorite. You can't really tell because of all the deliciousness piled on top, but the waffle is green from the cilantro-chickpea batter. Genius! Bacon S’more: slider w. graham cracker batter, mallow and chocolate with smoked bacon. Not much else to say here besides YUM. This one seemed to be the real crowd-pleaser of the evening. Their August menu is already posed and looks to be just as tasty! I can't wait to try all of these as well. (Good business model). 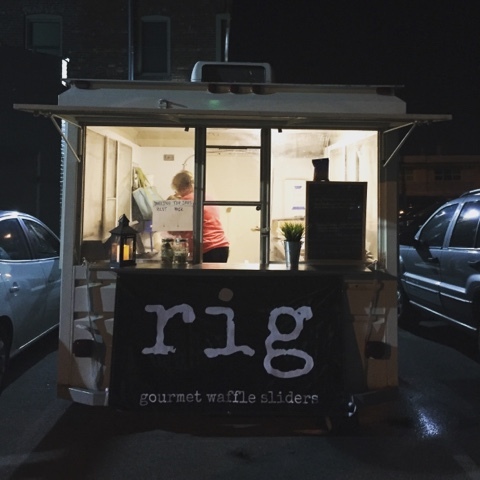 Rig does not have a website, but they are very active on Facebook at https://www.facebook.com/rigomaha, where weekly hours, menu updates, and delicious waffle pictures are routinely posted. You can eat your sliders in either Archetype or Scribtown. And Jodi (the owner) may even hand-deliver waffles to you - though I imagine that service may go away when Rig soon becomes swamped with business (and it will). Get here now before there's a line.